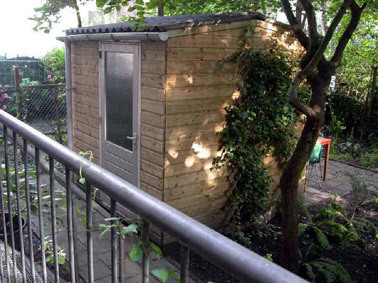 After moving from my Keileweg-studio space to the Rotterdam Oude Noorden district in October 2003, I had a groundfloor apartment with a garden and a shed at my disposal. For a while, I worked on a plan to bring this fallow potential into cultivation. September 4, 2004, I decided to found a new artspace: De Vrije Schuur (the Free Shed) abbreviated: VS. The Vrije Schuur was accessible via my apartment at the Bloklandstraat 151a and offered 17 sqm (shed-)wallsurface, 21 sqm tiled garden surface, a lot of furniture, an outdoor cooking device, a soup pan with a capacity of 15 liters, a VCR with monitor and an umbrella for when it rained. The objective of the Vrije Schuur was to promote culture in the broadest sense of the word by organising diverse activities in the field of visual arts, music, literature, theatre, video or film. The Vrije Schuur aimed to cooperate with fellow artists, cultural institutions or like-minded organisations. Small-scale was the catchword for the activities of the Vrije Schuur. There were physical restrictions to the dimension of the works as well as to the number of visitors. A policy, stemming not only from the spacial limitations of the location, but also from the opinion that small scale events intensified a personal experience. Visual artist Arnold Schalks programmed the exhibitions of the Vrije Schuur. He made an appeal to his circle of acquaintances, including visual artists, musicians, theatre- and film makers, writers and poets, to provide contributions to the Vrije Schuur presentations. However proposals from 'outsiders' were much appreciated. Usually, the Vrije Schuur worked on the basis of invitations. Arnold Schalks financed the Vrije Schuur activities with private money. The capital was mainly spent on infrastructure, organisation, communication and for the food and drink supply on the openings. The openings of the presentations were scheduled on Friday afternoons from 19.00 h. If possible, the presentations were preceeded by an introduction by the artists. Then the visitors could view the work, take a seat in the garden and serve themselves with a modest supply of food and drink. On the following Saturday and Sunday, persons interested, invited by means of an e-mail message or informed by the press, were welcome to view the presentations on opening hours to be announced later, or by appointment. The Free Shed was not Schalks' first art initiative. 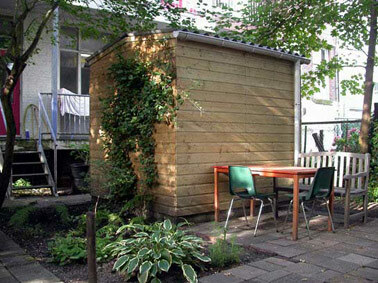 From 1997 to 2002 he put his cultural objectives into practice with Bühne de BovenLucht, In November 2009 the 'Free Shed' was followed by OCW, stage for small-scale events. Artspace the Free Shed was an activity of Foundation Bühne de BovenLucht.